UPDATE (3/19/2013): I have updated the figures below to incorporate the newly available GSS 2012 data here. The analysis below is generally still applicable. In the two previous posts, I laid out the data, methods, and preliminary results. Here, I'd like to start to analyze the independent variables of primary interest. By alienation, I mean the experience of social marginalization, disconnect, or isolation. In part, we can see this in the decline in trust in social institutions (e.g. the rise in the Tea Party in the United States). 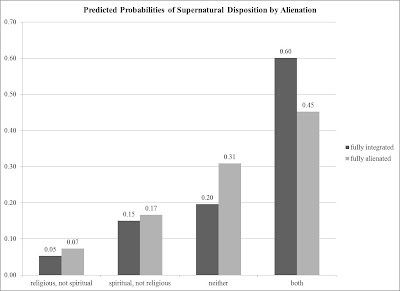 Religiosity is a supernatural disposition oriented toward a social institution, while spirituality is a supernatural disposition oriented toward oneself. Thus, I hypothesize that those who show signs of alienation are more likely to be spiritual and less likely to be religious. Interestingly, those who are fully alienated are more likely than those who are fully integrated to identify as neither religious nor spiritual but are less likely to identify as both religious and spiritual. 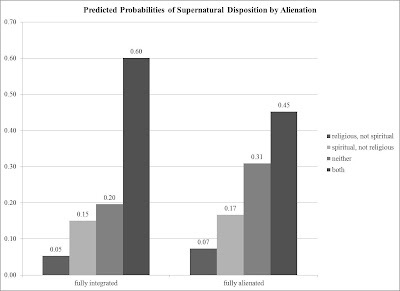 Additionally, those who are fully alienated are more likely than those who are fully integrated to identify as spiritual but not religious and religious but not spiritual.